You can change many attributes of a shape layer. For example, you can change the interior (fill) color or the edge (stroke) color, or for either component, you can apply a color of None.You can change the details of a stroke, such as the width, style (solid, dotted, or dashed), alignment, cap style, and corner style. And you can change unique properties for specific kinds of shapes (e.9., alter the radius in one or more corners of a Rounded Rectangle). 1. 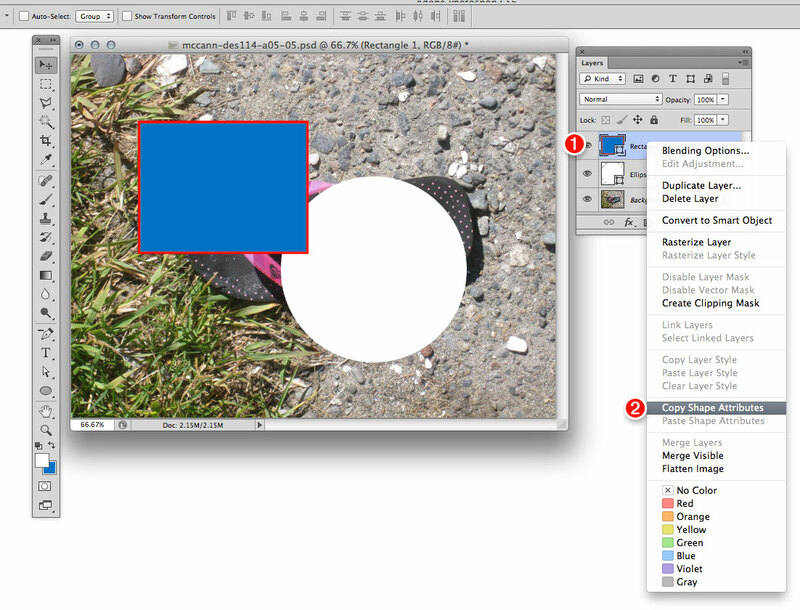 On the Layers panel, click a shape layer or hold down Ctrl/Cmd and click multiple shape layers. 2. For the remaining steps, to change the properties of a Rectangle, Rounded Rectangle, or Ellipse shape layer, you can use the Options bar; or to access more options, choose the Path Selection tool (R or Shift-A), click the shape in the document, show the Properties panel, then click the Live Shape Properties button. For a layer that was created with any other shape tool, use the Options bar. Click the (A) No Color button to apply a fill or stroke color of None. Click the (B) Solid Color button, then click a color swatch; or click the Color Picker button, choose a color, then click OK. Colors that you try out are added as temporary swatches below Recently Used Colors. 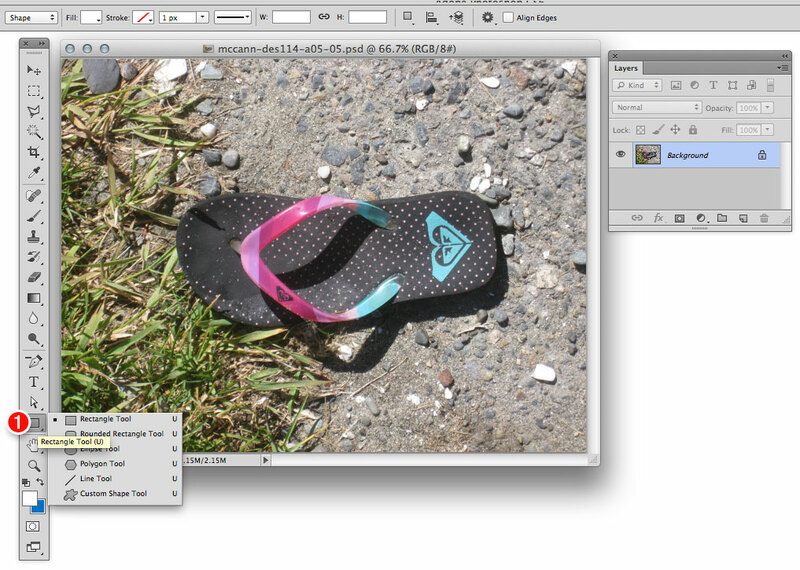 Click the (C) Gradient button to display a gradient editor, then click a gradient swatch. To add another color stop, click below the bar. To recolor a stop, double-click the stop to open the Color Picker, choose a color, then click OK.
Click the (D) Pattern button, click a pattern swatch, and adjust the Scale percentage, as desired. We clicked the (2) Fill Color swatch to open the picker, clicked the (B) Solid Color button, clicked a few colors, then clicked our favorite swatch under (3) Recently Used Colors. Change the Stroke Width value. Click the Stroke Options picker, then click a stroke preset in the scrolling window. From the Align menu, choose an option for the position of the stroke on the path. From the Caps menu, choose an option for the shape of the stroke at the endpoints — if the path is open — or for the shape of dots or dashes. From the Corners menu (Stroke Options picker) or Join menu (Properties panel), choose an option to make angles in the path (if any) mitered, round, or beveled. To resize the shape, change the W and/or H values. To move the shape to an exact location, change the X and/or Y values. To adjust the radius of any individual corner in a Rectangle or Rounded Rectangle make sure the Link icon is deactivated, and use a corner icon as a scrubby slider or enter a value in the field. 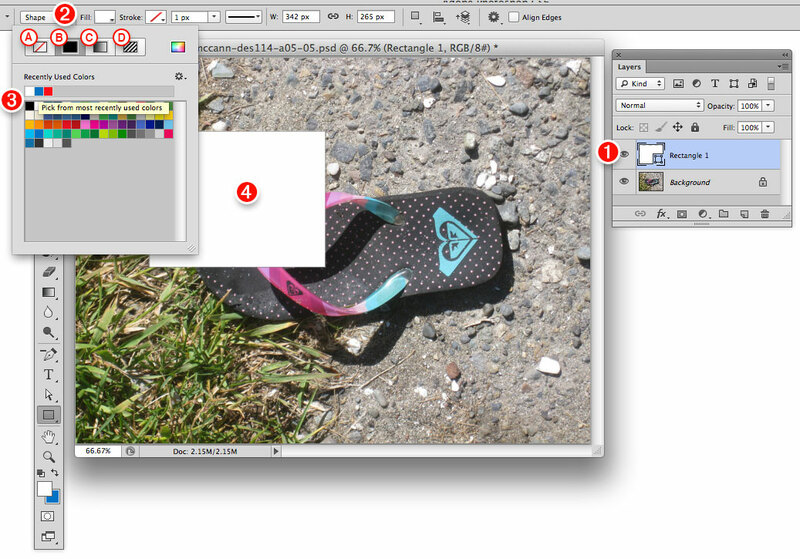 Or to adjust all four corners simultaneously, activate the Link icon, then change any one value; all four will change. To copy a fill or stroke color, gradient or pattern between shapes, click a shape layer’ and choose the Path Selection tool (A or Shift-A). From the menu on the Fill Color or Stroke Color picker on the Options bar or Properties panel choose Copy [Fill or Stroke]. Click another shape layer then choose Paste [Fill or Stroke] from the same menu. To copy stroke details (not colors) between shapes, click a shape layer. From the menu on the Stroke Options picker on the Options bar or Properties panel, choose Copy Stroke Details. Click another shape layer,then choose Paste Stroke Details from the same menu. Note: If the new details don’t appear, make sure the target shape has a Stroke color (not a setting of None). To copy all the stroke and fill settings from one shape to another, including the colors and stroke details, right-click a shape layer and choose Copy Shape Attributes from the context menu. 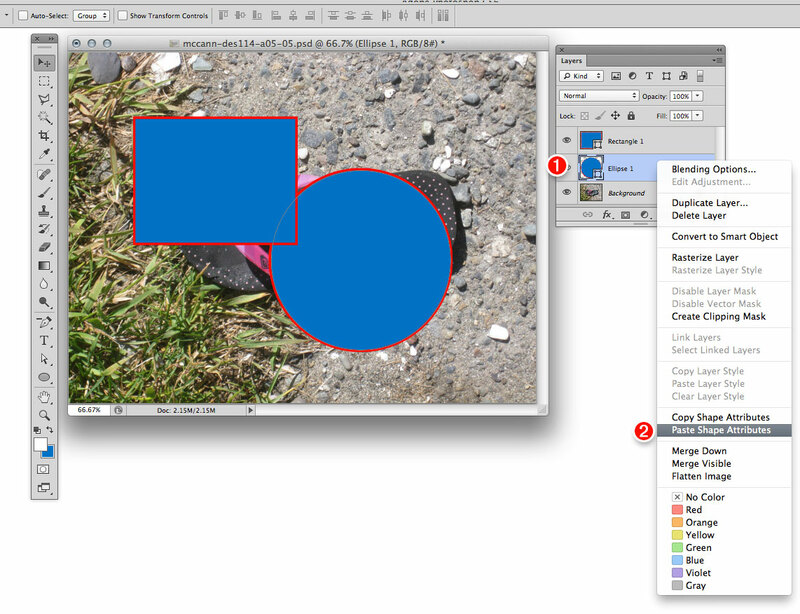 Click another shape layer, then choose Paste Shape Attributes from the context menu. Only one set of fill and stroke settings (e.g. one fill color, stroke color, and stroke option preset) can be applied to a given shape layer. You can’t apply unique settings to a sub-shape within a multi-shape layer. 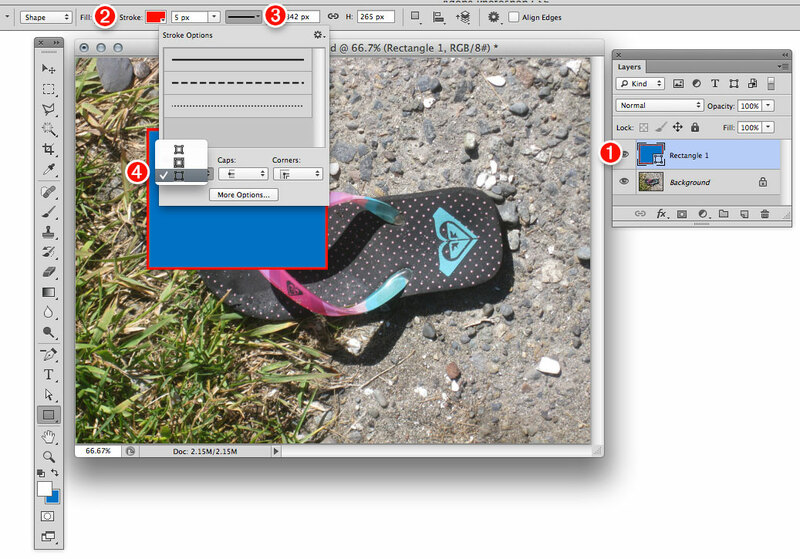 Hold down Ctrl/Cmd and click the shape layer thumbnail on the Layers panel. To convert a shape layer to a standard pixel layer, right-click the shape layer and choose Rasterize Layer from the context menu. 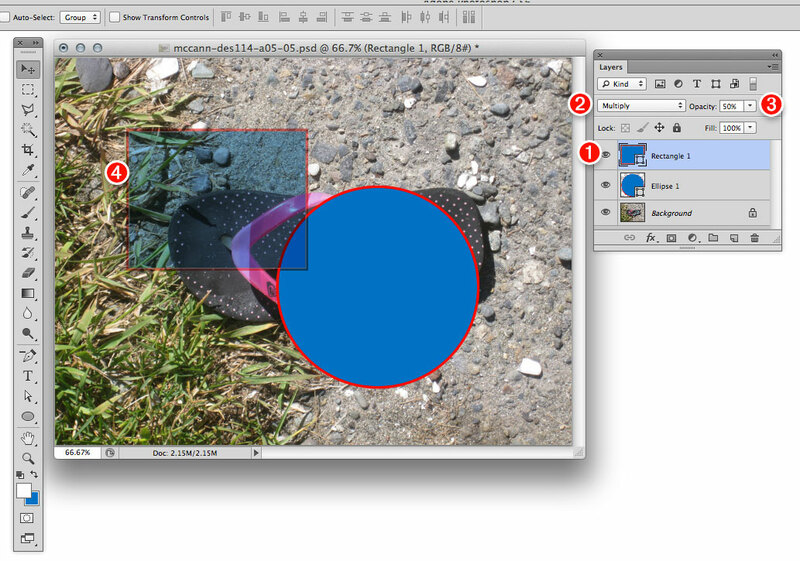 If you want to restrict future image edits to the newly rasterized shape areas, activate the Lock Transparent Pixels button on the Layers panel.